Trump also used the visit to criticize John McCain, saying the late senator “didn’t get the job done for our great vets.” He complained that McCain’s family didn’t thank him for giving the senator “the kind of funeral that he wanted.” McCain died last year of brain cancer. Trump’s visit to Ohio was his first since last year’s midterm election campaign, when the state was a rare bright spot for Republicans in the upper Midwest. 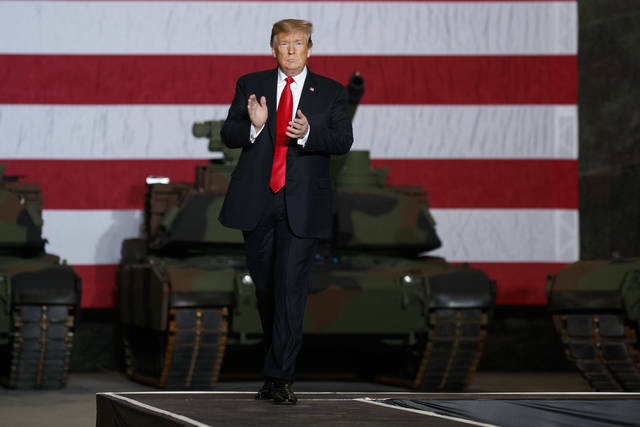 But with Trump’s path to another four years in the White House relying on a victory here, his nascent campaign is mindful of warning signs that Ohio can hardly be taken for granted in 2020. Perhaps no state has better illustrated the re-aligning effects of Trump’s candidacy and presidency than Ohio, where traditionally Democratic-leaning working-class voters have swung heavily toward the GOP, and moderate Republicans in populous suburban counties have shifted away from Trump. It’s for that reason, administration officials said, that Trump keeps returning to Ohio — this week’s visit marks his 10th to the state since taking office. 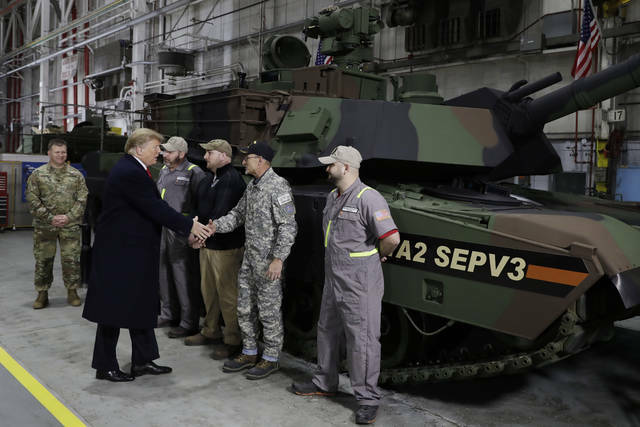 Trump visited the Lima Army Tank Plant, which had been at risk for closure but is now benefiting from his administration’s investments in defense spending. He also attended a re-election campaign fundraiser in Canton. For both parties, the results of the 2018 midterms have become a sort of “choose-your-own-adventure” moment for 2020 prognosticators. Republicans contend that the election of the state’s GOP governor, Mike DeWine, largely mirrored Trump’s 2016 path to victory and proves the strength of his coalition. They believe Trump’s coattails in the state are long, as incumbent Republican congressional candidates in suburban counties — like Reps. Steve Chabot and Troy Balderson — won re-election last year in no small part because of the president’s frequent visits. Trump said GM should re-open the plant or sell it to somebody who wants it. “Get it open now, don’t wait,” he said Wednesday. 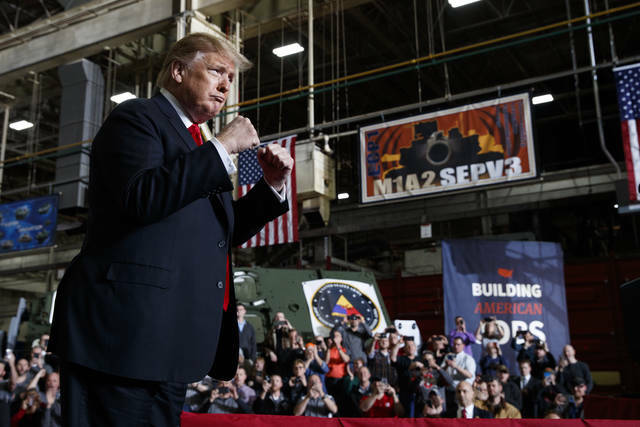 Trump continued his criticism of union leaders in his speech, saying, “They’re not honest, and they ought to lower your dues, by the way.” Last weekend he criticized a local union leader’s handling of the GM plant closure. Miller reported from Washington. Associated Press writers Catherine Lucey and Kevin Freking in Washington contributed to this report. WASHINGTON (AP) — The Pentagon’s inspector general has formally opened an investigation into a watchdog group’s allegations that acting Defense Secretary Patrick Shanahan has used his office to promote his former employer, Boeing Co.
Citizens for Responsibility and Ethics in Washington filed an ethics complaint with the Pentagon’s inspector general a week ago, alleging that Shanahan has appeared to make statements promoting Boeing and disparaging competitors, such as Lockheed Martin. On Wednesday, Blumenthal said that scrutiny of Shanahan’s Boeing ties is necessary. “In fact, it’s overdue. Boeing is a behemoth 800-pound gorilla — raising possible questions of undue influence at DOD, FAA and elsewhere,” said Blumenthal. Shanahan signed an ethics agreement in June 2017, when he was being nominated for the job of deputy defense secretary, a job he held during Mattis’ tenure. It outlined the steps he would take to avoid “any actual or apparent conflict of interest,” and said he would not participate in any matter involving Boeing. One example raised by the complaint is the Pentagon’s decision to request funding for Boeing 15EX fighter jets in the 2020 proposed budget. The Pentagon is requesting about $1 billion to buy eight of the aircraft. Shanahan, 56, joined Boeing in 1986, rose through its ranks and is credited with rescuing a troubled Dreamliner 787 program. He also led the company’s missile defense and military helicopter programs. Trump has seemed attracted to Shanahan partially for his work on one of the president’s pet projects — creating a Space Force. He also has publicly lauded Shanahan’s former employer, Boeing, builder of many of the military’s most prominent aircraft, including the Apache and Chinook helicopters, the C-17 cargo plane and the B-52 bomber, as well as the iconic presidential aircraft, Air Force One. (COLUMBUS, Ohio) – About one in 20 women develop preeclampsia during pregnancy, which can be life-threatening to both moms and babies. However, it is difficult to diagnose because symptoms often mimic those of a normal pregnancy, such as swelling and headaches. Managing the condition early is critical to keeping mother and child safe, and now a new innovation may help start treatment sooner by quickly identifying preeclampsia with a simple urine test. In a new study, researchers at The Ohio State University Wexner Medical Center tested a fast and easy test to accurately diagnose the condition in just three minutes. Researchers expect the new rapid test to be FDA approved in the next few years so that OB/GYNs nationwide can use it to identify cases of preeclampsia. Dr. Rood hopes it will also be available for women to use at home to monitor complications during pregnancy. (COLUMBUS, OH; March 20, 2019) –Mercy Health, a Catholic health ministry serving Ohio and Kentucky (part of Bon Secours Mercy Health), announces that it will serve as the exclusive Official Health Care Partner of the Ohio High School Athletic Association (OHSAA) for three years. OHSAA promotes the values of participation in interscholastic athletics as an integral part of a student’s educational experience. In addition, Mercy Health is collaborating with the Governor’s office and OHSAA to develop an initiative that will offer school engagement programs addressing youth addiction prevention as well as resiliency. Mercy Health, OHSAA and the Governor’s office will work collectively to identify and deploy science-based best practices with the aim of connecting students, parents, faculty and administration to much needed addiction prevention and resilience resources. Mercy Health is part of Bon Secours Mercy Health (BSMHealth.org,) one of the top 20 health systems in the United States and part of the top performing quartile of Catholic health systems for lowest cost per case for patient care. Mercy Health is the largest health system in Ohio and among the top five employers in the state, with more than 33,500 employees serving communities throughout Ohio and in Kentucky. Mercy Health provided care for patients more than 6.8 million times in 2017. The system includes assets of $6.8 billion and nearly 500 care facilities including 23 hospitals and 26 post-acute care facilities including senior living communities, hospice programs and home health agencies. Its clinically integrated network of more than 2,700 health care providers coordinates more effective and efficient care for more than 350,000 patients, saving money for taxpayers through the Medicare Shared Savings Program. As part of Bon Secours Mercy Health, the ministry provides nearly $2 million per day in community benefit. The Ohio High School Athletic Association is a private, non-profit association of high schools and 7th-8th grade schools, which are volunteer members. The OHSAA conducts postseason tournaments in 26 sports, including 13 for boys and 13 for girls, which involve more than 400,000 student-athletes, 65,000 coaches and 15,000 licensed officials. The OHSAA’s mission is to regulate and administer interscholastic athletic competition in a fair and equitable manner while promoting the values of participation in interscholastic athletics as an integral part of a student’s educational experience. The OHSAA represents its member schools by recognizing and promoting academics, the safety of participants, good citizenship and lifelong values as the foundation of interscholastic athletics. LEXINGTON, Ohio (March 20, 2019) – The Mid-Ohio School begins its 27th season of operation this Saturday, March 23, with two classes of its popular Teen Defensive Driving Program scheduled over the weekend. The entire 2019 schedule is available at midohioschool.com, and customers can register online or by calling 419-884-4000. The Mid-Ohio School offers professional driving and riding instruction to drivers and motorcyclists of wide-ranging skill, from teaching teenage drivers life-saving defensive driving techniques to giving professional racers tips for an extra edge in competition at speed on track. The high performance driving and racing courses and performance track riding for sportbike owners begin with the opening of Mid-Ohio Sports Car Course track in April. The Mid-Ohio School also offers Open Test & Tune twilight events on select late afternoons and evenings for drivers to take their personal street-legal cars or race cars on track. In addition to the Teen Defensive Driving Programs offered each weekend in March and four other dates in April, additional schedule highlights include the 3-Day High Performance Course offered first on April 8-10, then Open Test & Tune sessions for race cars and street cars on April 5th and April 25th, respectively. Motorcycles take to the 2.4-mile, 15-turn road course for the first time on April 22 with an afternoon riding session for Performance Track Riding. The Mid-Ohio School uses a fleet of Acura ILXs, Honda Civics, and Honda S2000s all custom-fitted with Cooper Tires to maximize the driving experience. Two of the vehicles are also equipped with skid systems to practice car control techniques for oversteer and understeer situations often encountered in inclement weather conditions. Additional sponsors of The Mid-Ohio School include Coca-Cola, Comfort Inn, Malco, Sunoco, Quality Inn & Suites, Summit Racing, and Total Oil. Based at Mid-Ohio Sports Car Course, in Lexington, Ohio, The Mid-Ohio School provides professional driving and riding instruction to drivers and motorcyclists of all skill levels. The school’s 16 automobile courses include the renowned Teen Defensive Driving program, as well as High Performance and Racing programs. The motorcycle side features two Performance Track Riding formats. Students enjoy classroom sessions, skill drills, expert private instruction and lapping on the same track that challenges the world’s top racers. The school is a past recipient of the prestigious Ohio State Highway Patrol’s Partners for Safety Award and partners with Maria’s Message each year to teach young drivers about the dangers of distracted driving. In 26 seasons, The Mid-Ohio School boasts 74,968 all-time graduates, including almost 22,000 teenage drivers and 19,000 motorcyclists. For more information, visit midohioschool.com, ‘like’ its Facebook page @TheMidOhioSchool or follow updates on Twitter @MidOhioSchool.